MosChip has in-depth expertiese in the areas of system architecture, board and firmware design, application software development, mechanical design, embedded applications, and user interface and experience. Our array of embedded design services can help organizations transform an idea to a product reducing the time-to-market. 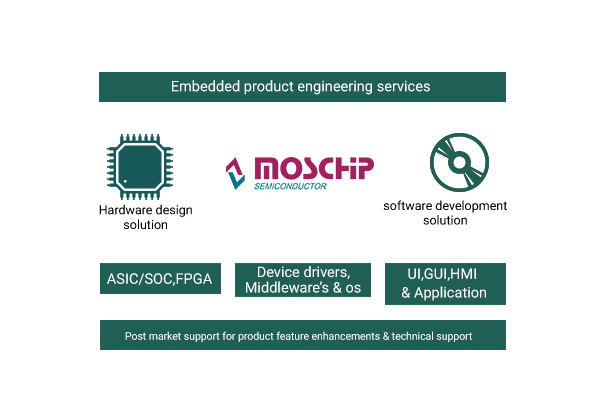 Embedded Hardware Design and Development is a major part of product development. Our proficiency in hardware design encompasses from concept to realization. This includes the design and development of multilayer PCB (up to 24 layers) and FPGA-based hardware. By ascendancy partners in the ecosystem, we render prototyping and testing, E-CAD, certification failure analysis and manufacturing. We also deliver hardware products globally across industries. At MosChip, we maintain a huge knowledge base, and our engineers constantly looking forward to best practices with one another. At MosChip we create custom BSPs & drivers. Our experts can analyse any custom hardware and create the software package that is needed to optimize both development process and behaviour of deployed device. A completed BSP initializes the target system hardware & provides function calls. These enable higher layers of software to communicate with low-level system components. Further, errors made at this critical level get quickly compounded throughout the system. −USB, BT, Ethernet, WLAN, PCIe, UART, Bluetooth, ZigBee, GPS etc.